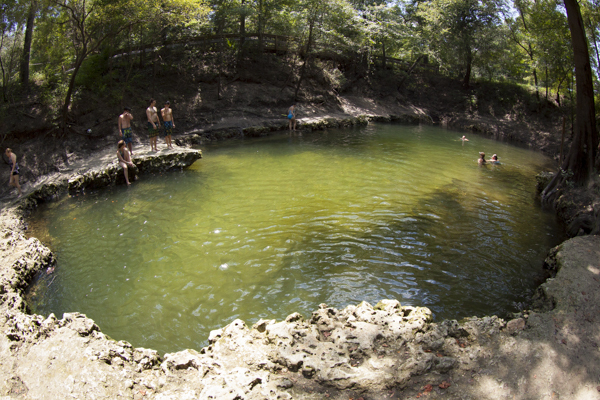 Visitors to Lafayette Blue Springs State Park can take a dip in the first-magnitude spring, cross the natural limestone bridge that spans it, marvel at the iconic Suwannee River or picnic under the shade of oak trees with their swaying Spanish moss. The spring is Lafayette's most visited location and accommodates every kind of adventurer seeker. Fish or canoe on the Suwannee River or stay in one of the park's rental vacation cabins, which stand on stilts high above the riverbank. Bicycling, hiking and wildlife viewing are favorite pastimes for visitors. The picnic area has tables, grills and two pavilions, which are popular for family reunions and parties. Explore the spectacular depths of the well-known Green Sink Cave System. Certified divers can venture into several passageways in this spring's vast 12,000-foot underwater system. This family/pet friendly location is the perfect place to make lifelong memories. The park is open year-round from 8AM until sundowna lively daytime getaway and a peaceful overnight stay. For travelers looking for more luxurious accommodation, there are a number of hotels in the nearby town of Mayo or along the river just outside of the park. NEARBY TOWNS: Mayo - 8 miles; Live Oak - 27 miles; Fort White - 39 miles; Gainesville - 76 miles; Tallahassee - 78 miles; Jacksonville - 110 miles; Tampa - 186 miles; Atlanta, GA - 283 miles. ACTIVITIES: Hiking, scuba diving, biking, canoeing, kayaking, fishing, tubing, swimming.